One of PhotoModeler’s interesting features is the Stereo Viewing option. This is a fun feature that when on makes the 3D Viewer display a red/cyan stereo anaglyph. With the appropriate colored glasses, you can see the object in the 3D Viewer “pop” out of the screen! 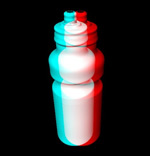 This image shows a water bottle model in Stereo View. The Stereo View can also assist in viewing and reviewing of a project. When viewing in stereo, the human eye can sometimes pick out errors that are hard to see in a normal 2D view. You can adjust the value in “Offset Between Stereo Views” to control depth effect.